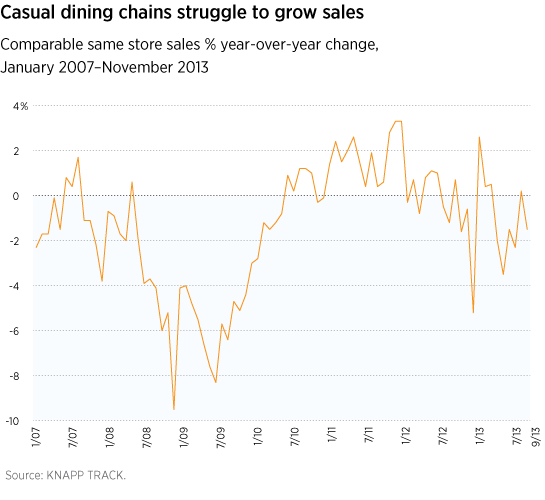 A lackluster U.S. economic recovery and declining consumer sentiment often get blamed for weak sales at restaurants. However, another important factor has emerged: Fewer women are working outside the home. U.S. consumers continue to curb spending in the wake of the recession because they remain worried about losing their jobs in today’s environment of persistently high, if moderately improving, unemployment. Compounding the problem: changes in spending trends, such as diverting from buying clothing to making larger purchases such as cars and homes to take advantage of low interest rates. All of these factors add up to weaker consumer spending. Some retailers, notably those in the casual dining segment of the restaurant industry, have been feeling the pinch. In addition, a survey of restaurant traffic for the first half of 2013, compared with the past two years, revealed persistent declines, particularly in casual dining and mid-scale — also considered “family” style — restaurants, according to industry tracker The NPD Group/CREST. Generally speaking, women in the United States control most household budgets. The recent labor force trend of fewer women working for pay outside the home may be amplifying declines among restaurants, particularly in the area of family dining. The labor force participation rate for women in the United States — that is, the number of working-age women employed or looking for work — slipped to 56.9% in October 2013, from 58.1% in 2010, according to the Bureau of Labor Statistics. Women’s workforce participation peaked at 60% in 1999 and has since been steadily declining. In prior years, with greater numbers of women in the workforce, household income rose along with the standard of living. This led to changes in spending patterns over the years as well as lifestyle changes, according to the Labor Department report. For example, the DOL found in the early 1970s that the average family allocated 72.4% of money spent on food expenditures to food eaten at home, while 26.4% was spent on dining out. By 2002, 58.1% was allocated to food eaten at home, while 41.9% went for dining out. Workforce participation by women packs a powerful economic punch and has an influence on industry dynamics. If U.S. women participated in the workforce at the same rate as men, it could boost U.S. gross domestic product by 5%, according to the International Monetary Fund.